What an odd name, “ang butter”? Question to myself when I kept seeing photos of this dessert flavor combo. 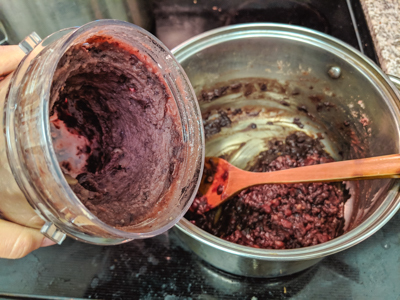 Ang = short for “anko” which refers to sweet red bean paste, often made by boiling the red beans and mashing or grinding them with honey or sugar added. 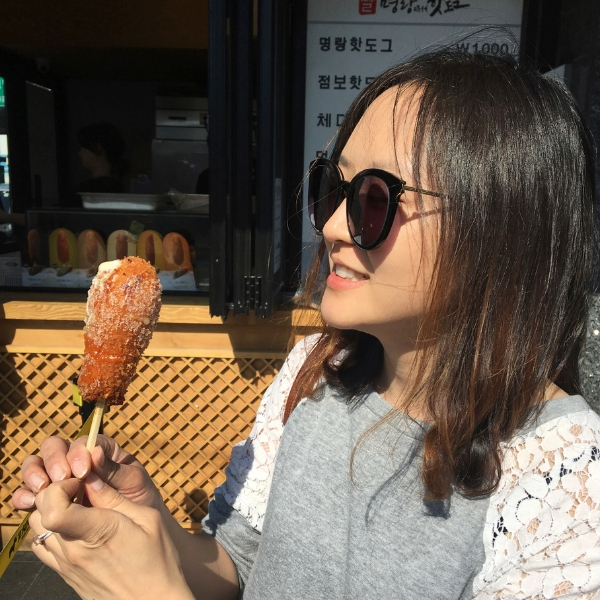 Ang butter is a flavor combo that has become a hot trend in the past year or so all over Korea. I’m actually a bit late to this! 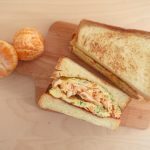 I’ve seen so many instagram photos, cafe reviews and YouTube videos about eating or making them! 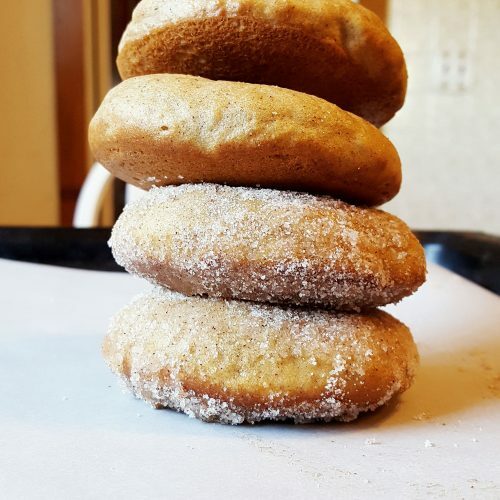 It can be found in baguettes, crackers, pretzel breads, scones and anything else you could think of in corporate bakery stores to the small specialty stores! I tried to find where the craze started from but I’m not sure actually. All I know is that I have been very curious on the flavor and decided to try it out on this scone! I made the English scones from Cupcake Jemma/Fifteen Spatulas and not the American ones since there’s less butter in English versions with the intention that they will be slathered with something (jam and clotted cream!). The photos show me making 6 but it actually worked better when I made them into 8! I accidentally didn’t roll it out enough until it was too late… oops! 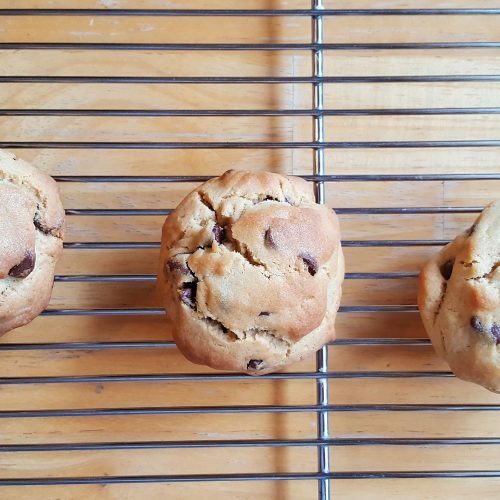 If you already have your favorite scone, feel free to make that instead! 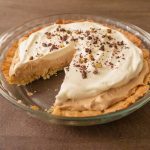 There are so many different slight variations to the recipe depending on the preferred texture and sweetness. 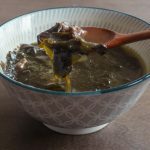 Sweet red bean paste is often used in many different types of Korean recipe i.e. pat bingsoo (Korean shaved ice), as a filling for red bean buns, or filling as red bean sticky donut! In pat bingsoo, I like it when it’s slightly chunky and liquidy, whereas for the filling of the red bean buns, I prefer it to have no red bean skin and more paste like. The recipe here can be adjusted. 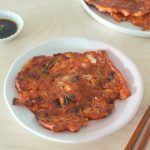 I went with a slightly chunky (red bean skins in tact) but paste-like so the red bean would hold its shape. Good butter is important. Good salted butter is best. But, if you’re like me, and rarely have salted butter then good unsalted butter works too. But good butter. Not the costco butter will make a huge difference in the flavor. I made a cup of red bean for this but you can go as little as ¼ cup. (Just take one-fourth of the recipe and may need to decrease the cooking time). I made more because it takes awhile, so why not? Rinse the red beans. In a medium sized pot, add the beans and 2 cups of water. Bring it to a boil on medium high and continue to simmer for about 5 minutes. Drain the beans of the water. *This helps to discard of the very starchy liquid. 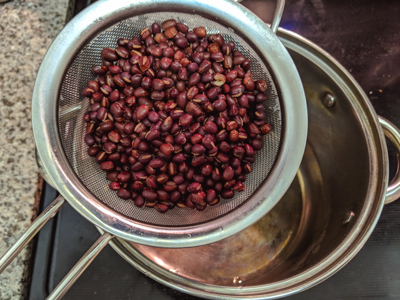 Return the beans to the now empty pot. Add 2 ½ cup of water. 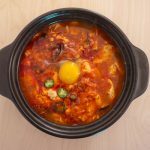 Cover the pot and simmer on low to medium-low heat for about 45 minutes. Take a peek at the pot. If the water has reduced a bit, add 1 cup of water. Continue to simmer for about another 45 minutes covered. Check on the beans occasionally and give it a stir. 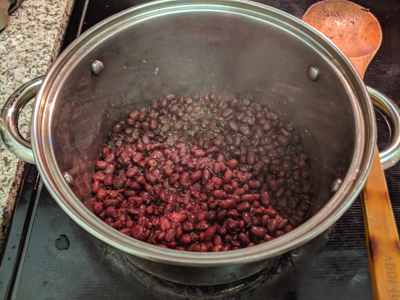 Make sure there is enough water so the beans are not sticking to the bottom. I added 1/2 cup more water at the end. Add more as needed but not too much, yet. Continue to simmer until the beans are very soft and can easily be crushed by a spoon. Stir in the sugar, honey and salt. 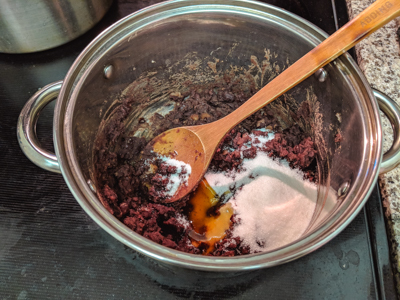 As the sugar is added, the beans will liquify again. Add about ¼ cup more water and simmer for about 10 more minutes. Check on the beans occasionally and give it a stir. Add more water or simmer to evaporate water until pasty consistency. 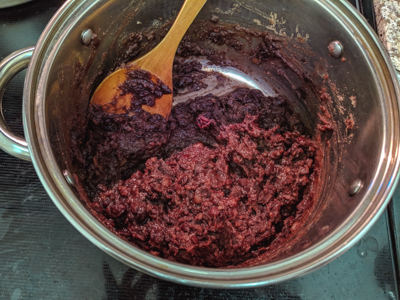 *Optional, if you wish to have a slightly paste-like but also have some chunks of red bean in the texture, take about half of the beans in the pot and run it through a food processor or mixer until smooth. Place in an airtight container and set aside until the scones are done! Sift together the flour, baking powder, sugar and salt. Dump into the food processor. Add in the chopped butter. Pulse for about 5 seconds or until the butter is pea-sized. **I find it easier to chop into equal sized pieces and pulse in the food processor. For American scones, you can just cut them into smaller sizes but for English scones (these ones!) 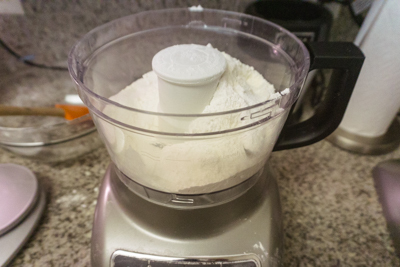 you really want to use a mixer or food processor if possible. For English scones, you don’t want to see the individual butter pieces like in pie crust. Make sure the butter stays cold! 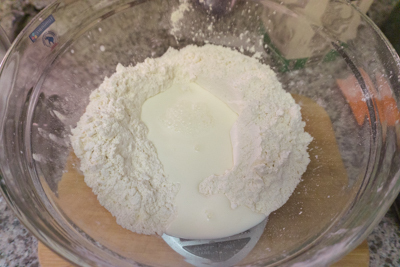 Dump the flour mixture into a large bowl or on a flat surface. Make a well in the flour and pour in the milk. Mix very gently until JUST combined. *I like to stack the dough on top of each other to make the dough more flakey. As the dough is coming together, divide the dough in half and stack one slab on top of the other. But only very gently bring the dough together.If you feel the dough is already well combined, don’t divide and stack. If you over mix it, the dough will turn tough! Gently roll it to 8 inch x 4 inches. Cover in saran wrap and let the dough rest in the fridge for about 15 minutes.Take the dough out and cut into 2 in x 2 inch (5 cm) squares. In a small bowl, crack and mix one egg. 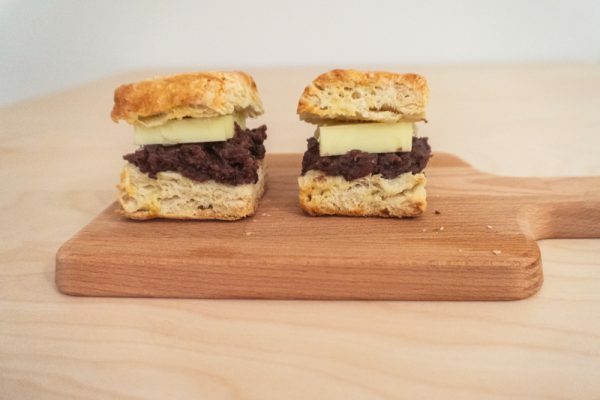 Use a pastry brunch and brush each scone with a bit of egg. 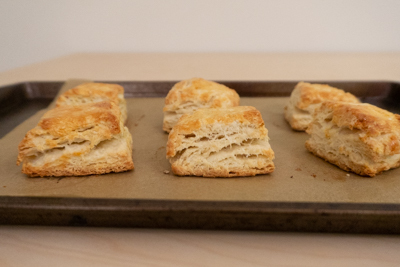 In a preheated oven at 425 degrees F (220 degrees C), bake the scones for about 15 minutes, until golden brown. Cool to room temperature. Cut the scones in half. 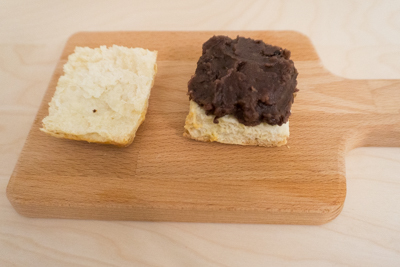 Fill the scone with about 1 ½ Tbsp of the red bean paste. 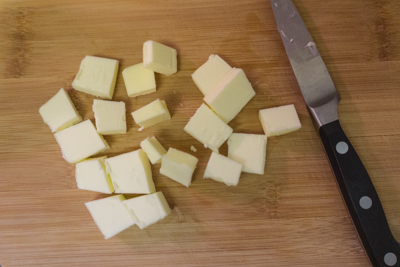 Cut a piece of butter, about 1 Tbsp. Enjoy!!!! 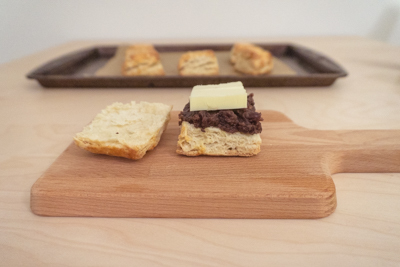 A sweet red bean paste sandwiched with salted butter in between two creamy scones. Almost like a butter and jam combo but nuttier in flavor. Rinse the red beans. In a medium sized pot, add the beans and 2 cups of water. Bring it to a boil on medium high and continue to simmer for about 5 minutes. *This helps to discard of the very starchy liquid. Drain the beans of the water. Return the beans to the now empty pot. Add 2 ½ cup of water. Cover the pot and simmer on low to medium-low heat for about 45 minutes. Take a peek at the pot. If the water has reduced a bit, add 1 cup of water. Continue to simmer for about another 45 minutes covered. Check on the beans occasionally and give it a stir. 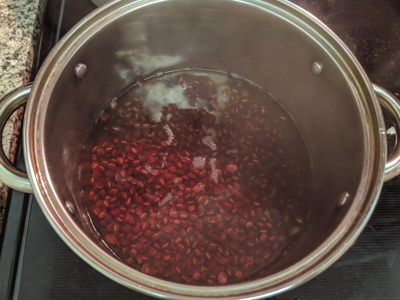 Make sure there is enough water so the beans are not sticking to the bottom. I added 1/2 cup more water at the end. Add more as needed but not too much, yet.Continue to simmer until the beans are very soft and can easily be crushed by a spoon. Stir in the sugar, honey and salt. As the sugar is added, the beans will liquify again. Add about ¼ cup more water and simmer for about 10 more minutes. Check on the beans occasionally and give it a stir. Add more water or simmer to evaporate water until pasty consistency. 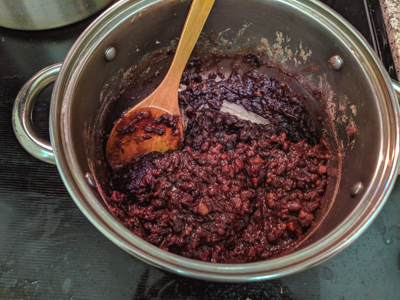 *Optional, if you wish to have a slightly paste-like but also have some chunks of red bean in the texture, take about half of the beans in the pot and run it through a food processor or mixer until smooth. Sift together the flour, baking powder, sugar and salt. Dump into the food processor. Add in the chopped butter. Pulse for about 5 seconds or until the butter is pea-sized. **I find it easier to chop into equal sized pieces and then pulse in the food processor. 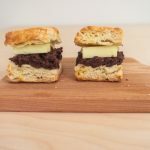 For American scones, you can just cut them into smaller sizes without a food processor but for English scones (these ones!) you really want to use a mixer or food processor if possible to get them into the the smallest crumbs. 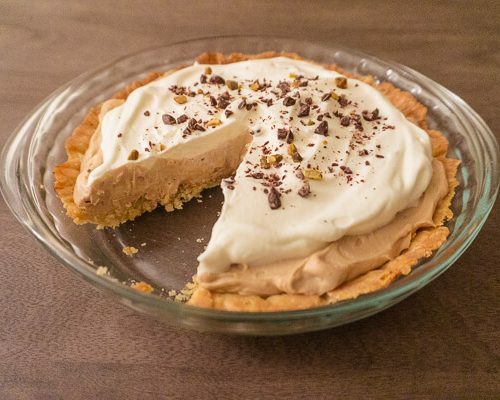 You don't want to see the individual butter pieces like in pie crust. Make sure the butter stays cold! 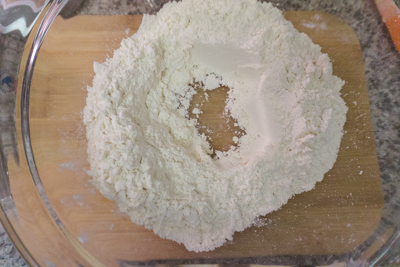 Dump the flour mixture into a large bowl or on a flat surface. Make a well in the flour and pour in the milk. Mix very gently until JUST combined. *I like to stack the dough on top of each other to make the dough more flakey. As the dough is coming together, divide the dough in half and stack one slab on top of the other. But only very gently bring the dough together.If you feel the dough is already well combined, don’t divide and stack. If you over mix it, the dough will turn tough! Gently roll it to 8 inch x 4 inches. Cover in saran wrap and let the dough rest in the fridge for about 15 minutes. 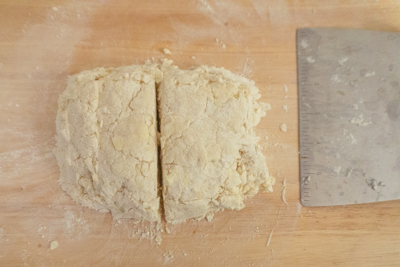 Take the dough out and cut into 2 in x 2 inch (5 cm) squares. In a small bowl, crack and mix one egg. 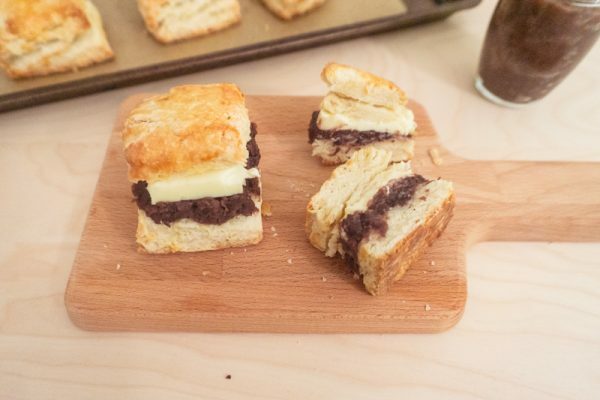 Use a pastry brunch and brush each scone with a bit of egg. In a preheated oven at 375 degrees F (190 degrees C), bake the scones for about 20 minutes, until golden brown. Cool to room temperature.